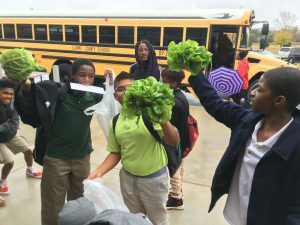 During the 2018 school term, GIKI VISTAs at each Clarke County School District middle school are organizing student-run produce markets utilizing student-grown produce from the school gardens. Proceeds in the form of donations from community members will support the agriculture science classes at each school. Additional produce is given to students to take home. Over 300 pounds of produce has been grown and harvested at the school gardens for these markets.